Fletcher's reign marks the start of a new chapter for the Indian cricket team. Foreign coaches in India, in whatever sport, are never at peace. Former disgruntled greats are always quick to lash out. They question whether a foreigner will be able to adapt to Indian culture, the weather, cuisine. The one question which is never far away is: does India suffer from a paucity of home-grown talent that it continously feels the need to search amidst foreign shores? Sunil Gavaskar, for one, would not agree; in the days following Duncan Fletcher’s appointment as the fourth consecutive foreign coach of the Indian team, he opined that Mohinder Amarnath would have been a better choice as ‘the core of the Indian team today is from the Hindi-speaking belt’. Now that Duncan Fletcher’s been appointed, he has an interesting challenge on his hands. The Indian media predictably has already bombarded TV screens and newspapers with all the nitty-gritties of his life. As a result, pretty much every Indian cricket fan now knows that Fletcher was born in Rhodesia in 1948, captained Zimbabwe to a win over Australia in the ’83 World Cup and became the coach of the South African domestic team Western Province in 1993 before leading them to victory in the first-class and limited-overs competitions. His record with England has been discussed threadbare: a dream spell up to the 2005 Ashes before plummeting to depths of woe. It has been said that Fletcher has never been a very media-friendly man. He will face his toughest test when he confronts the Indian media, who have never been known for subtlety. So, what lies ahead for the new Indian coach? First and foremost, his equation with the current poster boy of Indian cricket, Captain Cool himself, Mahendra Singh Dhoni. The bond forged between a captain and a coach has the capability to either destroy a team or inspire them to newer and greater heights. Ganguly and Wright instilled that never-say-die spirit in the team in 2000 which later in 2011, was harnessed to its fullest potential by Dhoni and Kirsten. In between, Greg Chappell and Rahul Dravid had a disastrous time, as India sought to experiment a bit too much and promptly were eliminated from the 2007 World Cup in the first round. Fletcher’s equation with Dhoni is certainly a task uppermost on his agenda. The relationship Dhoni and Kirsten shared has almost become the stuff of folklore; it is well-known that Kirsten preferred letting Dhoni enjoy the limelight, while staying in the background himself. It would not be a bad idea for Fletcher to do something similar. He forged a very successful partnership with Michael Vaughan and Nasser Hussain, who both swear by his man-management qualities. Dhoni however is different from the two. He is cool, calculating, but not averse to going by his gut feel. He will not like anyone interfering with his captaincy style, especially after he’s won a World Cup. Where Fletcher can probably help Dhoni is with his batting. Not to say, Dhoni is a bad batsman; he’s still among the very best in limited overs. But his batting in Test still provides scope for improvement, and Fletcher can probably sit with him and try and sort out some technical frailties. Second to Dhoni, Fletcher and Sachin Tendulkar should have some interesting conversations. Only Sachin knows how much cricket he has left in him and probably it is a lot. Going by the odd chance that Fletcher still hasn’t figured out the kind of hold Sachin Tendulkar has in Indian cricket, he probably will in the next few months. But, being the senior most player in the team today, he will have a lot to share with Fletcher. Fletcher should sit with Sachin in his initial few days at the helm, as Sachin would be the best person to give him the lowdown into the madness that is Indian cricket. Fletcher, known for being meticulous, also has to ascertain from Sachin how much cricket he has left in him, whether he will continue to play limited overs cricket etc. Though this sounds blasphemous, it is for the good of the team, after all, as this will help Fletcher plan and build his squad for the next few years. Kirsten did a damn good job with the thin resources available to him and the onus is on Fletcher now. Zaheer Khan has been shouldering the burden for too long and he needs a worthy sidekick. As mentioned before, there are already too many contenders and plenty still coming up in the Indian domestic circuit. Somehow, in some way, Fletcher needs to groom someone into becoming world-class. Maybe, he could try and harness an Ishant Sharma who has briefly in the IPL, looked vaguely similar to the bowler who hurried and heckled Ricky Ponting. Or perhaps he can guide the mercurial Sreesanth who on his days can destroy a South African team in their own backyard? This is one issue which is pertinent only for the Test team and does not apply to India’s ODI and T20 teams. 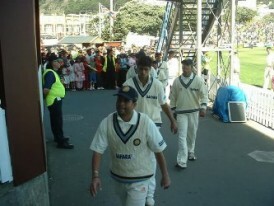 The future of Dravid, Laxman and though it sounds blasphemous, Sachin. The sheer class which Dravid and Laxman bring to the Indian test team supersedes every other concern, whether they being too old or anything else. But retire they will someday, and this retirement day looms sooner rather than later. Fletcher needs to form a fair idea about them and start grooming their replacements. There are already talented Indian batsmen coming through the ranks but their biggest test will be on the Test arena. This is where Fletcher must identify and recruit potential replacements. Kohil is the next big thing in Indian cricket but he still hasn’t been properly tested in Tests. There are players like the extremely talented Chetestwar Pujara and Murali Vijay who are also knocking on the doors. It would actually be foolish to think of a replacement for Sachin. What Fletcher needs to ensure is a proper transition from one era to the other. A bunch of stars retiring all at once will lead to a Australia-like situation which will only spell doom. Fletcher must, at all costs, avoid that. Indian coaches have a notoriously fickle relationship with the BCCI. They are praised to the skies one day after a comprehensive win. The next day, the Indian team loses by 10 wickets and the BCCI are quick to blame the coach. The mad, chaotic world of the BCCI is completely different from the professional setup of the ECB which Fletcher was used to. His capability to adjust again will be tested; what will also be tested are his networking skills. Whether his relationship with the selectors, the cricket officials or even the men who call the shots, Fletcher needs to maintain absolute neutrality. The corridors of cricket power in India are well known for being entrenched in a lot of wheeling and dealing; there will always be characters who will want a favour and two. Dhoni and Kirsten also shared an uneasy relationship with the selectors; there were even times when Dhoni admitted he was not very happy with the team selected for him. Probably after a World Cup victory, Dhoni should get a bit more leeway regarding selectorial decisions, and Fletcher should use his immense cricketing acumen to help Dhoni spot rapidly rising talents. The number one team in Tests and the World Champions in ODI?s are still no 2. in the ODI rankings. And though Dhoni might say that rankings don’t matter, Fletcher’s first job is to get them to the top in the ODI rankings. And for India to truly establish their dominance over the game, they will have to maintain that No 1. over the next few months. India tour West Indies in June-July, a tour where the Indian team will now be expected to dominate. Fletcher will probably join the Indian team in earnest when India arrives in England for the start of a long tour. This will be India?s first tough assignment as they seek to defend their No 1. status. It will be slightly ironical for Fletcher as he will seek to defeat England, a team he created with his own sweat and blood, with India. Tours to Australia also loom in the offing which will give Fletcher another chance to avenge his 5-0 whitewash in 2006-07. In 2012, Sri Lanka hosts the T20 championship. Dhoni, being the ambitious man he is, will want to pull off an unprecedented treble: being world champions in all three forms of the sport. Duncan Fletcher has a job on his hands. And it promises to be a fun time for Indian cricket.